BT appears to have slowed the pace of its next generation broadband roll-out for a number of reasons. Most readers will be aware that DG Competition has still not given its approval for the release of more than £1bn under the BDUK procurement framework because of concerns over wholesale access to the resulting infrastructure. This is holding up about 30 NGA projects in both cities and rural areas. Liv Garfield, CEO of BT’s infrastructure arm, Openreach, told the recent NextGen12 conference that its £2.5bn Infinity fibre to the cabinet project now “passes” more than 11 million homes. But take-up rates so far are thought to be under 10%. The conference was full of talk that BT is now concentrating on preserving cash flow, so NGA roll-outs that use BT’s cash are unlikely until it gets more paying customers. It said it was taking remedial action to bring the number of missed deadlines back to it target of 10% by November. Another is that it has asked the firms that actually dig the trenches, throw the concrete, fit the cabinets, that it wants price discounts of between 20% and 30%. This was confirmed by a delegate at the NextGen conference. A sub-contractor to Openreach’s primary contractors, he told Br0kenTeleph0n3 that NGA business had pretty much dried up following two years of breakneck activity. He was expecting his customers to pass on the discount request in the near future. “It’s just not there,” he said. The contractors have reportedly responded by asking for a 270-day notice period for contract starts. That means even if BT won NGA contracts today for say, Derbyshire, the earliest shovels could break ground is 8 July next year, says a source close to county council procurements. Parish and council elections in 33 counties are due in May next year. Many councillors who have promised voters superfast broadband may have to enter the election unable to make good their promise if they stick with the BDUK procurement framework. LAs heard that the bidders could handle no more than five bids “until progressed far enough to ensure process is running smoothly”, and then no more than three per month to start, with performance dictating actual numbers at any time. According to DCMS, five LAs have already signed contracts: North Yorkshire, Rutland, Lancashire, Surrey and Wales. Nine procurements are under way: Cambridgeshire, Cumbria, Devon & Somerset, Herefordshire & Gloucestershire, Highlands & Islands, Norfolk, Oxfordshire, Suffolk and Wiltshire. DCMS has published a spreadsheet detailing the order in which the remaining LAs can bid. Mark Heath is tracking the NGA spending here. This includes UK taxpayers’ money via BDUK and other government budgets, BT’s “matching funds”, and even the EU’s contribution. WHEN will someone at HMG ‘notice’ the way rural broadband is unravelling under the BDUK framework and say something, or is ‘Nelson’s Eye’ back in fashion? The other question of course is how DC’s spin doctors are going to ‘spin’ this one. I believe we are currently reckoned to be around No 20 in the Euro-league for broadband and I understand the forecast is we will be No 27 by 2015. It is a fair old jump up to No 1 and will require consumate skill at HMG to ‘adjust’ the criteria to make us ‘the best’ by 2015. Is there a link to this euro table? 50% of the UK has access to VM, 11M properties with access to FTTC and more coming. If take up is an issue then maybe this shows that speed is not an issue for some, yet. The Broadband Stakeholder’s Group report (http://www.broadbanduk.org/index.php?option=com_content&task=view&id=491&Itemid=7) shows take-up of >24Mbps broadband in the UK is almost twice (6% of households) that of Japan’s after three years (see figs 33 and 34). BSG doesn’t think the UK will get to Japan’s 48% penetration rate in five years. It notes that a lot of Japanese homes are on fibre already, thanks to political will and a competitive market. Competition has depressed ARPUs, but all operators are expected to break even in five years as costs drop and profitability accelerates. No, sorry. I just recall seeing it somewhere and I think it was based on the likely impact of Liv’s ‘discovery’ of what she cannot/will not do .As I said, it all depends on definition. Why are contractors saying there is a 270 day (9 month) notice period. Do they not want any work? Any confirmation that this is true? Don’t forget the recent weather damage and related delays that occurred over the summer, which have a tendency to slow roll-out as new provisions and related work must be held while engineers focus on repair work. This doesn’t affect Openreach’s mobile task force too much, which is now being boosted by several hundred additional engineers, but it certainly can play a part in delays with more experienced local engineering teams. Also it’s a good idea not to mix up the privately funded roll-out (£2.5bn) to 66% of the UK with the publicly funded BDUK one, the latter of which won’t even begin to show in BT’s roll-out plans until next year (excluding separate projects, such as in Cornwall). But from what I can see BT should still achieve their 66% target by the end of 2014 (note: this use to be 2015). I understand from Openreach that there are only one or possibly two more commercial roll-out announcements (new exchange upgrade lists) due to be announced, which should happen early next year and then we will see the BDUK funded stuff coming into play. Thatnks for that Mark. 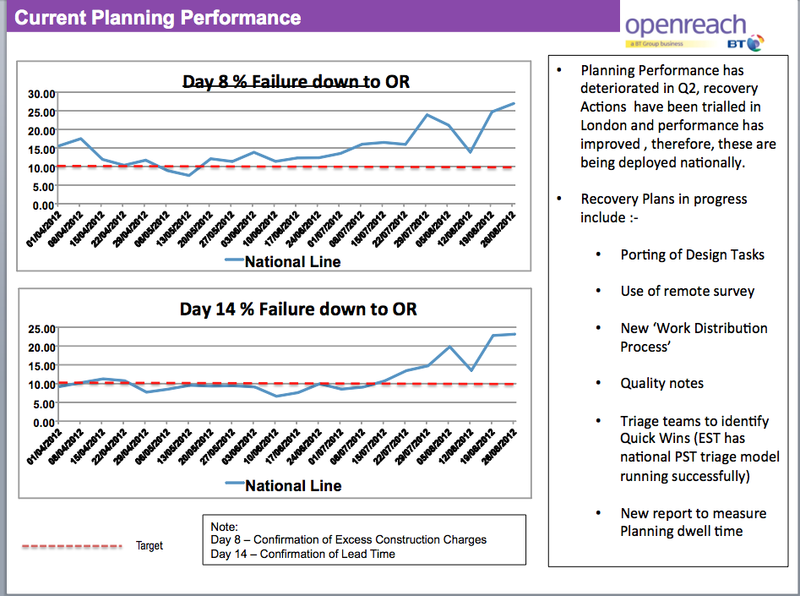 So you are saying that the BDUK roll-out won’t start until BT’s own NGA is finished. That will not delight quite a lot of county councillors who are up for election in May next year. Aren’t you assuming too that the European Commission has no problem with BT being effectively the only possible winner of contracts under the BDUK framework, when the law currently says state-aided procurements must be held in a competitive environment? Difficult to be sure but the indication we had from an Openreach bod was more or less that one would finish and then they’d focus on the BDUK stuff, which doesn’t sound unreasonable. I’m not sure if their next announcement will only include exchanges under their own privately funded scheme though but that’s roughly the indication I was given. However it’s important to note that I see some BDUK projects hoping to start their roll-out by the end of 2012, so we might have a period where some exchanges are upgraded prior to BT releasing an update.. not sure how they’re intending to handle it. As for the issue of EC state aid approval, yes obviously this is assuming that the bulk of BDUK projects are given the green light. Recent stories suggest that an agreement has been reached on this issue but we don’t know what the required alterations are and or whether that will make a material difference. http://www.thinkbroadband.com/news/5498-growth-of-fibre-to-the-home-across-europe.html does not paint a healthy picture with a huge gap to make up – it is based on actual ‘connections’ and not the mythical ‘homes passed’ favoured by BT. Of course, if the rest of the world would just stand still and let us overtake…………………………………………. The question is why ‘homes passed’ is not tuning into ‘connections’. Over 50% of the UK has access to VM and FTTC speeds but not buying. Does it matter? Some time back people made the point that residents of Cardiff weren’t taking up Infinity because VM was well-entrenched and offered a better and cheaper service at the time. Many of those who weren’t on VM were on Sky or TalkTalk. The lack of take-up among ‘homes passed’ comes from being late to market with an inferior product. BT is trying to remedy that by spending �1bn to beef up BT Vision’s offer, an idea that punished the share price when it was announced. If BT had gone for the Market 1 customers it would have had little or no competition and a market eager for something better than the rotten ADSL service most get. What’s the significance of Sky and TalkTalk? Isn’t the problem with Market 1 the cost of deployment? Imagine the outcry of BT giving the best speeds to Market 1 first and ensuring its monopoly by hoovering up all the customers before the community altnets had had chance to build their solutions. The slowness of BT and BDUK means that altnets have another two years to get their business going and show what is possible in the rural UK and actually lead the world, when many countries are debating what to do outside their capital city. Also if the projections were wrong, BT would be left in the situation where it might be facing very stiff resistance from share holders to invest in the more populated parts of the UK, and these areas would be almost impossible to get State Aid Approval for. Market 1 may have better take-up, has anyone got any data so show this? Many in Market 1 hate BT so it is not clear if they would buy their service, or that is the impression one gets listening in at conferences. The main problem with market 1 is that it is a few hundred here, a few hundred there, and repeat about 3,000 times to cover perhaps 2 million households. The same number of cabinets can be enabled and cover perhaps 10 million households in the market 3 areas. Take up of FTTC is not that far behind other countries with both full and partial fibre and given the competition from VM and 3G it looks fairly good. “Market 1 may have better take-up, has anyone got any data so show this?” is the wrong question; there was no demand for the wheel, the inclined plane, the Archimedes screw, Large Hadron Collider etc until someone invented it and showed that it was useful. That said, the results from Cumbria’s Project Access suggest what is possible with time, and well within BT’s claimed 12-14 year payback period. “In the UK we love things to be failing and be the underdog, or to put it another way, the outlook is very emo” – actually, Andrew, there are a lot of people who would love things to be succeeding (and some who are, despite BDUK), but yes, there is ’emotion’ in the topic as we watch the spend. Slowing to a crawl? Not near here, 30 cabinets being installed.